Yogurt is an excellent first food because it has bacteria which are good for intestinal health. Yogurt makers use these bacteria to ferment the milk to produce yogurt. Why can you give your baby yogurt at 6 months but you cannot give your baby whole milk? The fermenting process breaks down the lactose and proteins that could irritate baby's stomach. For example, adults with lactose intolerance can eat yogurt and most cheese without a problem. Feed your baby the whole milk variety of yogurt (though it can be difficult to find in stores because it all seems to be low-fat) and don't add anything to it to start. If baby finds the plain yogurt too sour go ahead and mix in some sweet potato or banana to make it more palatable. You may be surprised when your baby actually likes a really sour taste that you find offensive. This is a good time to talk about flavored yogurts which may quickly become one of your toddler's favorite snacks. They can contain a large amount of added sugar that make them fall into the "dessert" category of foods instead of the "healthy snack" category. Some parents continue to buy plain yogurt as their child matures and add maple syrup or jam to control the sweetness of the snack. Look for plain whole milk yogurt that does not contain RGBH hormones. YoBaby (Stonyfield farms) sells a plain version in little cups. Greek yogurt is a good choice as well. 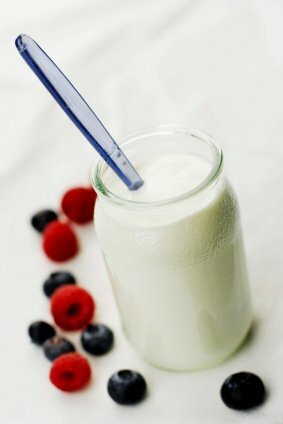 If you believe that your baby finds plain yogurt too sour then mash some banana or sweet potato to sweeten it up a bit. Do not add sugar or buy yogurts with flavors. 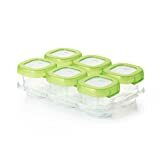 Keep in refrigerator for 3 days after printed freshness date on container. Yogurt is much less perishable than milk because it is already "cooked" with bacteria. Yes. Organic milk products mean that there are no pesticides, no growth hormones, and no antibiotics. The cost is justified if you can do it. As yogurt eaters, most of us eat the pre-flavored containers that are come in the lowfat and no-fat varieties. But, even as adults our bodies need fat (just not too much of it). You might find that when you eat your baby's whole milk yogurt that you need less of it to feel satisfied. Mix it with your cereal in the morning or other fruits for a mid afternoon snack. Half cucumber and remove seeds. Chop and dust with salt. Put in a colander and let set 10 minutes to one hour. Rinse cucumber, pat dry, and mix with yogurt - add dill (if you have it), parsley, and/or pepper. The name "Winter Squash" can denote quite a few different varieties of squash. Acorn, Butternut, and pumpkin are good examples of winter squash. Jars of baby food can contain a mixture of these squashes. For our purposes, we will begin with the easily recognizable butternut squash. It is tan in color with a neck and bump on the bottom, and it is ubiquitous in grocery stores throughout the year. It stores really well in a dark cool place then, so you can buy it and when you have time roast it for your meal. The squash should be firm with no soft spots or damage. One of the most difficult things about preparing squash is peeling it. Since you don't have much time to spare as a new parent, we recommend roasting it. Also, roasting really concentrates its sweet flavor which, if you are lucky, baby will like. 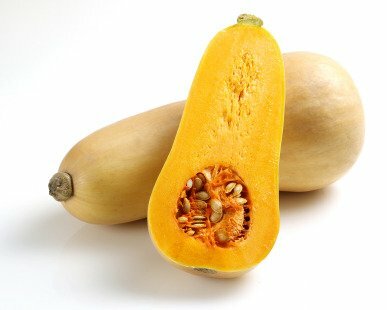 If you decide to make an entire butternut squash for your baby, you will have a lot left over. Preheat oven to 325 F. Cut squash from top to bottom and remove seeds and strings. Place on aluminum foil on baking sheet and bake for 1 hour until very very tender. Scoop flesh away from skin and mash. Keep in a cool dry place - not in the refrigerator (keep with the onions and potatoes). It will store for up to 2 months. No. Not necessary here. Winter squash has a tough skin that protects it from pesticide contamination. Below are two ways to work with pre-roasted butternut squash. The easiest is to just serve it roasted on the side of your plate as an alternative to potatoes or rice. If you have a bit more time, it is really simple to make a puree of butternut squash soup that is an excellent starter or makes a good lunch with a grilled cheese sandwich. Puree squash in blender, adding stock to get to desired consistency. Pour into large saucepan on stove and reheat. Now it is time to season with flavors that you prefer. Try ground cardamom, cinnamon, ginger or nutmeg. Serve with a dollop of plain yogurt. See above roasting recipe for baby. Ground spices such as cardamom, ginger, cinnamon, or nutmeg. There is no reason to limit yourself to making baby food or buying baby food in jars. Do both if you can! You will be introducing lots of different textures and tastes this way (your butternut squash will taste different than Gerber's) and jars can be convenient when you are on the run.